Planting the proper flowers, trees, and shrubs for pollinators, but it won’t work if you use chemical controls on your property. Avoid pesticides! This goes without saying. 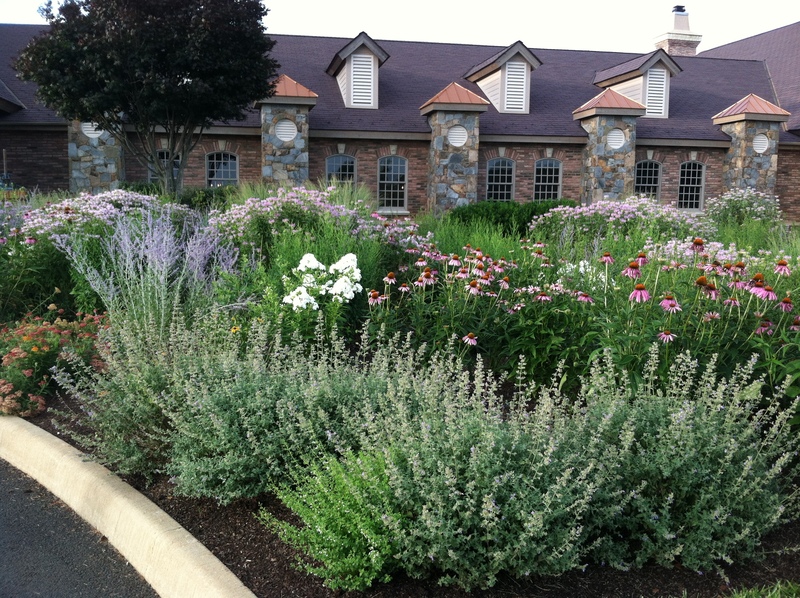 In addition, ask the local nursery if they use systemic pesticides on their ornamentals. You might unknowingly bring home plants that have pesticides in their vascular system that permeates the nectar and pollen – every part of the plant. Even the White House uses all organic pest controls and fertilizers. When Michelle Obama announced this in 2009, it caused quite a furor with the agricultural giants, like Dow, Dupont, etc. Read this letter that Mid America CropLife Association sent to the White House at http://www.lavidalocavore.org/diary/1309/. Basically, they defended using chemicals on crops as an American way of life! They encourage using “crop protection products” on the garden. Planting for pollinators is very popular now, but what exactly should you plant that will attract the biggest variety of beneficial insects? Use local native plants. Research shows that local natives are four times more attractive than exotics. An example of this: Because cultivars are selected primarily on ornamental traits, it is not always clear if they perform the same ecological role as the native plant species. In many cases they do not. Echinacea is a case in point. Crazy bizarre shapes and colors of Echinacea are coming on the market. These Echinacea cultivars are sometimes sterile (bad news for birds, who want the seed) and often have a “doubled” flower form (bad news for pollinators, who can’t reach the pollen and nectar). 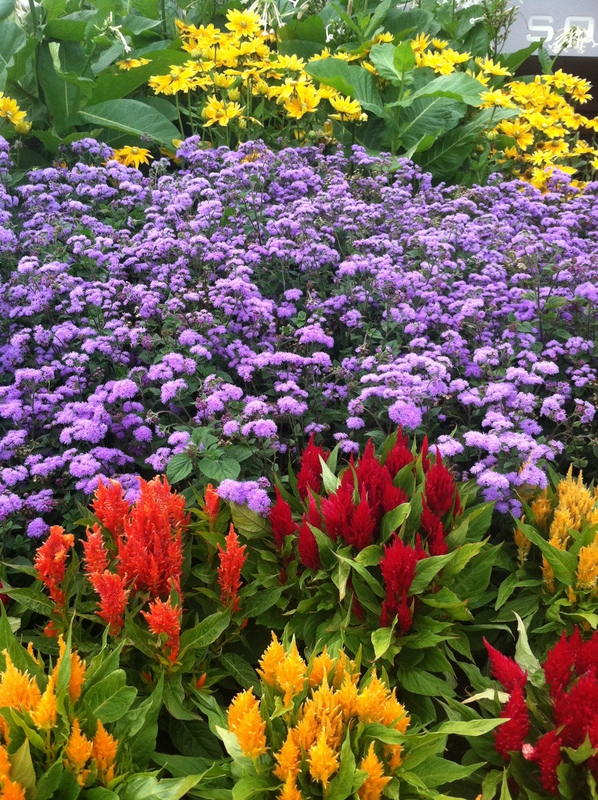 Colors matter: choose blue, purple, violet, white, and yellow colored flowers for the most attractive power. Reds and oranges attract hummingbirds and sphinx moths. 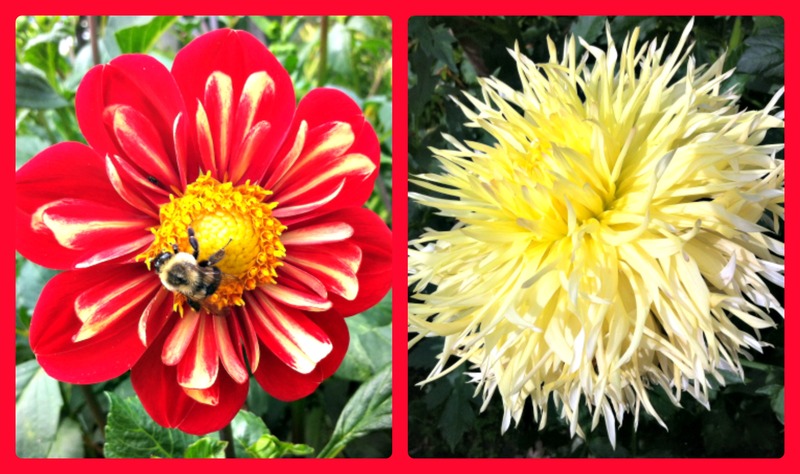 Sweet or stinky smelling flowers also attract pollinators, like bats at night. Plant in clumps. Drifts of at least 4 feet in diameter are most effective. Include flowers of different shapes. Pollinators have different tongue lengths, so by providing a variety of flowers, you will benefit a variety of pollinators. Have a diversity of plants flowering at different times of the season. By providing pollen and nectar throughout the growing season, you are providing food for pollinators that fly at different times of the season. 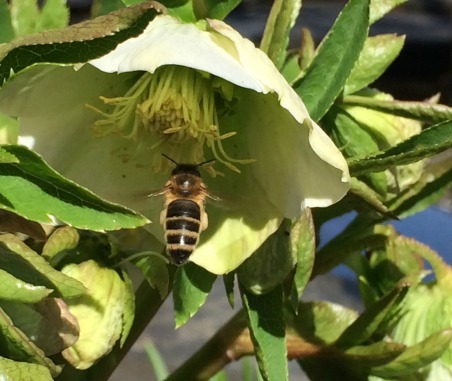 Especially try to provide very early flowering plants such as Hellebores or Witch Hazel that bees love to visit. See my post on Hellebores at What is Deer Resistant, Blooms in the Winter, and is Evergreen? As a general rule, single blooms are more attractive than full frilly ones. It is harder to get to the good stuff, the nectar and pollen. 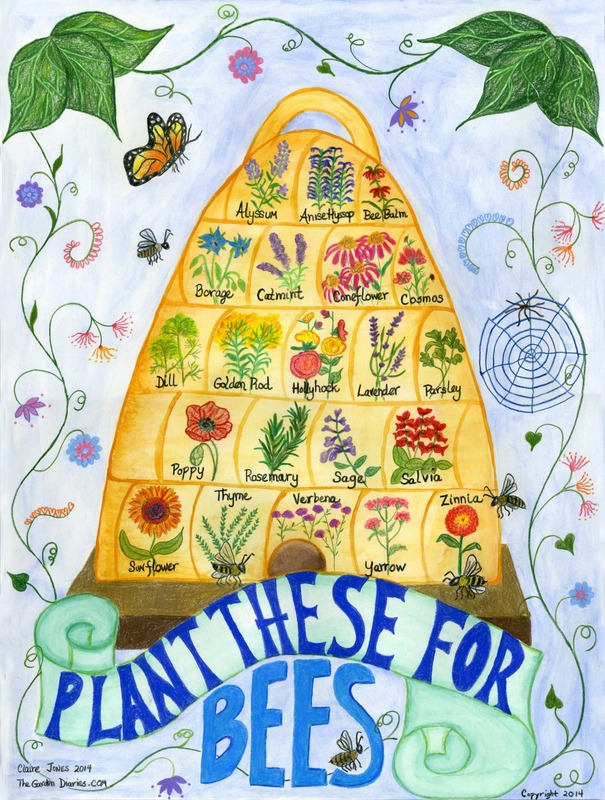 Provide water for the bees, butterflies, and hummingbirds. This could be as simple as a bird bath with some rocks with landing areas to rest on. Plants that you would normally remove when done – especially lettuce, radish, cilantro, dill, and lettuce – let flower and go to seed. I know that I plant lots of veggies and herbs early and can’t harvest them all before the weather warms up in the summer. The radishes get tough and knarly, and the lettuce gets bitter. Leave these to finish out their life cycle and the bees appreciate it! For local lists for your area, go to www.xerces.org. 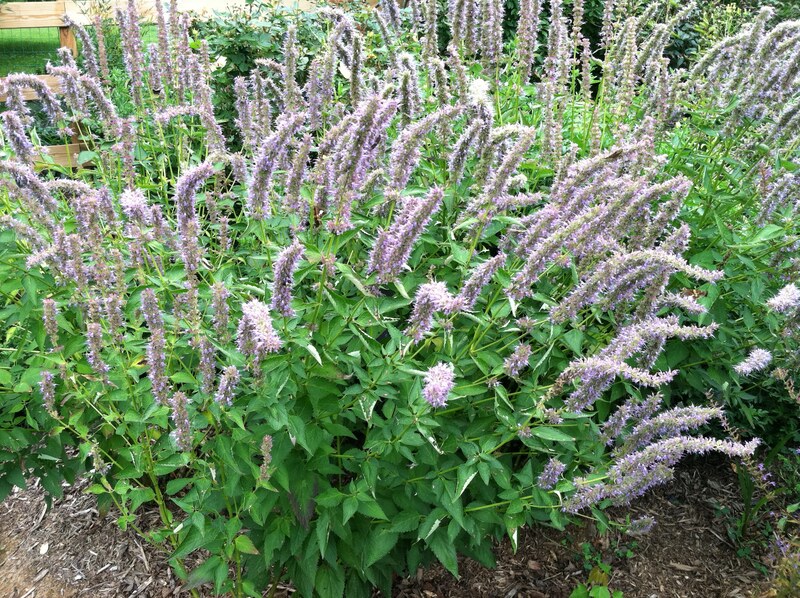 As a long time gardener, I have noticed which plants bees zero in on and I have planted these every year because of the benefits that bees brings to my garden. Good information to have. Thanks for posting!! I love your blog Claire. Thanks for this information which I will save for reference! Words fail me. As I continue to read of the damage that big pharma is doing, I’m weak in the knees with fear for our entire planet. They will eradicate us with a nozzle full of round-up. Nuclear weapons won’t be needed. Will anyone wake up in time??? If I with a measly high school education and a senior citizen can get it, there must be someone with good intelligence that can turn this around. I agree. I feel helpless and frustrated that these big companies are only concerned with the bottom line. Thanks, I can mail you one. They cost $28, plus shipping of $5.It is 18″ x 24″. Do you fo a chart same as bees but gor cats. I have a garden patch for butterflies and now I know what to plant to attract bees. Now I want to also make it friendly for my two ginger cats.